A great granite massif was eroded into the present shape of Mt. Bukhan. In the times of the Koryo Kingdom, it was called Mt. 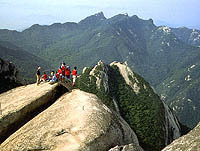 Samgaksan or Three Corned Mountain, as the summit consists of three peaks of Baekundae, Insubong and Mankyongdae. Insubong, having a worldwide famous rock wall more than 200 meters high, offers over 100 courses for rock climbing to professionals and amateurs as well. Standing on the summit of Paekundae, you can get a spectacular view of metropolitan Seoul and the serene flow of Han River. 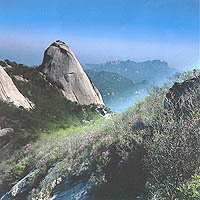 In spring, the Jindalae ridgeline and other trails are embellished with fantastic azalea blossoms. A guided mountaineering program is available in which master climbers explain the wild flowers, curious rocks, and historical relics of the mountain.